The Lugana appellation is around the base of Lake Garda, one of the most beautiful places in Italy. The soils here in the heart of the appellation are calcareous clay, rich in minerals; the altitude is about that of the Lake itself, which is to say about 65 meters (200 feet) above sea level, despite which the wines show excellent fresh acidity (altitude normally confers acidity, as for example in the wines of Verdicchio di Matelica, but here there is a bright, zesty character even without it). 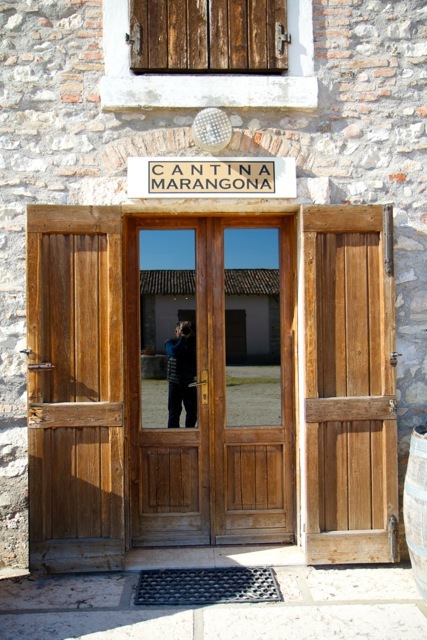 Alessandro Cutolo is the young owner and winemaker at Marangona, a modest, friendly man whose clean but not intrusive style of winemaking is very much to my taste. I will be drinking a lot of this. 'Marangona' refers to the name of a bell that was rung to signify the end of the work day. 100% 'Turbiana,' or Trebbiano di Lugana, grown using a 'double arc' cordon in calcareous, mineral-rich clay soil. The grapes are picked by hand into small boxes, pressed as whole clusters, and fermented at low temperature. Once fermentation is complete the wine is aged on its fine lees for about 4 months, then bottled early in the following year. No oak or malolactic fermentation. The vines are around 20 years old. Pale straw color; aroma of almonds, herbs, citrus and a touch of apricot; flavors completely consistent, with excellent acidity, fresh and long. I love this as an aperitif, or as a broadly useful table wine (roast chicken, fish...). 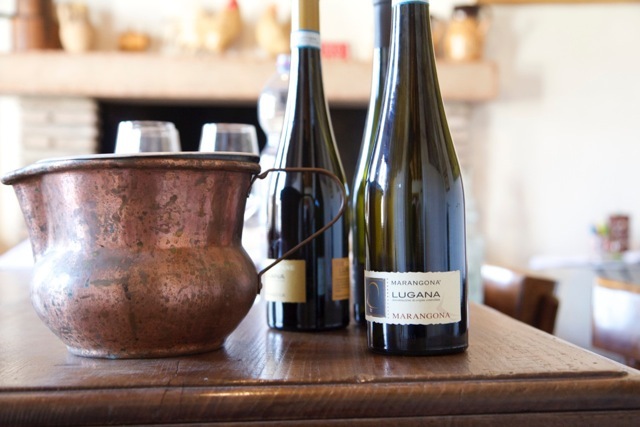 Tre Campane means 'three bells,' signifying the three communes of Lugana where the grapes for this cuvee are grown. The estate vineyards are all in the historic part of the Lugana appellation, in the communes of Pozzolengo, Sirmione e Peschiera, no more than half a mile from Lake Garda. The vines used here are older, an average of around 30-35 years of age. Alessandro harvests the grapes in two parts, 50% in mid-September and the remainder in mid-October at full ripening, allowing him to make a wine with excellent fresh acidity and added body and complexity. The grapes are picked into small boxes, pressed as whole clusters, and fermented at low temperature. Once fermentation is complete the wine is aged on its fine lees for 12 months, then bottled early in the following year. No oak or malolactic fermentation. In other words, similar to the regular Lugana but with the volume turned up. Pale straw color; aroma and flavor of almonds, herbs, citrus and a hint of apricot; long, medium-bodied, with very fresh acidity. Bright enough to work before dinner, but would be excellent with salmon or many different kinds of pasta.